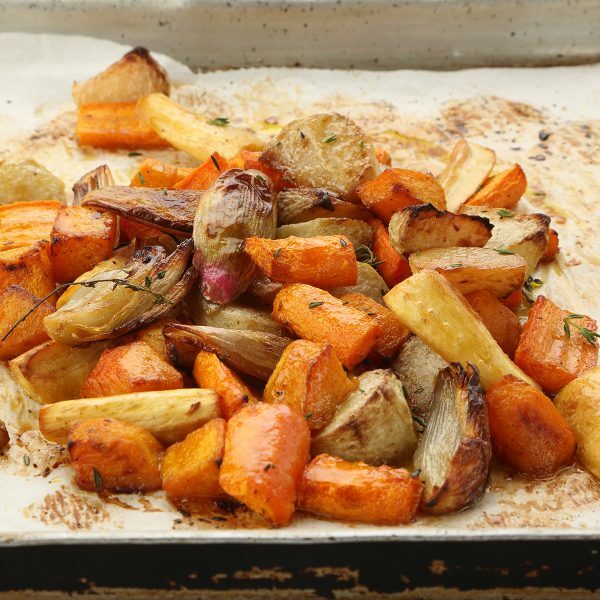 Roasted root vegetables with maple syrup - home cooked food delivered. A hearty, healthy accompaniment to any meal, this dish is an homage to the humble root vegetable which will see you through even the coldest winter evenings. A selection of butternut squash, carrots, banana shallots, parsnips and the increasingly popular kohlrabi, all roasted to perfection with a coating of maple syrup, is guaranteed to warm the cockles of your heart. Butternut squash, kohlrabi, carrots, parsnips, banana shallots, maple syrup, seasoning, wholegrain mustard (MUSTARD). Place ingredients on a baking tray in a preheated oven at 180c for at least 15 mins or until piping hot. Keep refrigerated and use within 3 days.